‘Tis the season for an elegant cheeseboard, my friends! Soon, friends and family will be gathering around delicious food all over the world, so I figured I would help you assemble a beautiful cheese board to impress your guests. 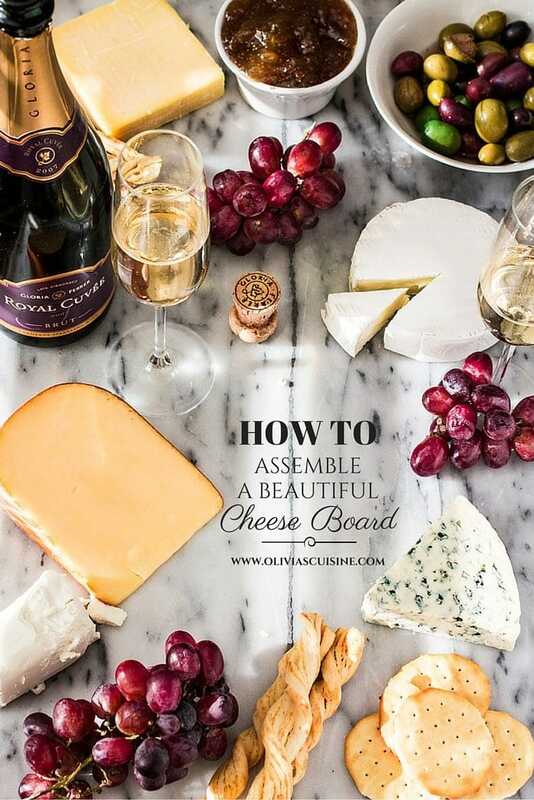 But how hard can it be to assemble a decent cheeseboard, you might be asking yourself. Well, you’d be surprised! I’m in no way a cheese snob (ok, maybe a tiny little bit of a snob) or connoisseur. I just love cheese. A LOT! Like, my ultimate dream is to swim in a pool of melted Gruyere. Ha! Just kidding. That would be gross, right?? ? ? In my opinion, the secret for a great cheeseboard is a variety of flavors, textures, forms and colors. Sharp, smoked, funky, sweet, soft, hard, fresh or aged cheese, they all deserve a little space on your board. And before you freak out thinking this will cost you a kidney, let me tell you that there are cheeseboards for every budget. If you’re trying to save a few bucks, you might be tempted to do a cheeseboard full of cheap cheese from the dairy section. Don’t do that! Just pick one or two really good cheeses and fill the board with some other food and fruits to make it look nice. More on that soon! Also, if you’re unsure how much cheese you’d need, a good rule of thumb is to calculate 4oz of cheese per person. If budget is not an issue, I recommend going with three to five nice cheeses. You can also be creative and choose a theme for your board, like “French cheeses” or “Italian cheeses”, for example. 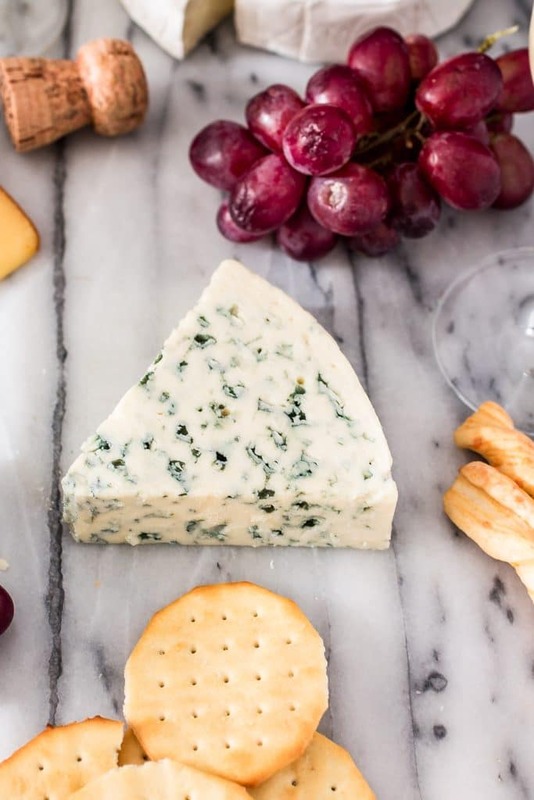 If you’re going super bold and choosing an “all blue cheese” board, make sure you know your guests well, as not everybody is as bold as you (and me! I’m crazy about blue cheese!). It was really hard to narrow my cheese love to only 5 types, but I thought it ended up being a good balance of flavors, forms (wedge, square, log and wheel), colors, boldness and textures. If you’re not sure what cheeses you’d like to present on your board, a good cheesemonger will be able to help you. Just tell them what your favorite flavors are, your budget and the occasion, and they will recommend some nice cheeses that are guaranteed to please your guests. Make sure you take your cheese out of the fridge and unwrap them about one hour before serving, as cheese is best served at room temperature. If you’re afraid the cheese will dry out, just cover with a damp towel until ready to serve. When assembling the board, just think of an art canvas and arrange your cheese in a beautiful way. It’s good to separate the funky, stinky cheeses from the other, so they don’t contaminate the milder cheeses. For that same reason, I also like to offer one knife for each cheese. Nobody wants to eat brie cheese that tastes like gorgonzola! If you don’t own cheese knives, butter knives will do. And while you can slice your cheese to make it easier for your guests, please do not cube the cheese. In my opinion there’s nothing tackier than cubed cheese on a cheeseboard! Cheese cubes belong in your kids lunch box. ? 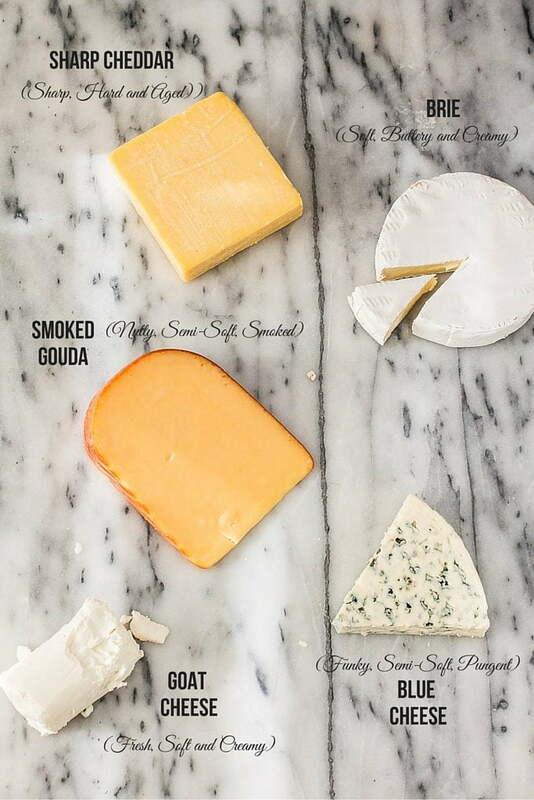 You can also label your cheeses, so that people know what they are eating. You can find reusable cheese markers at any specialty store, like Sur La Table, or even at cheese stores. Fresh fruit, honey, olives and nuts are my usual choices. I love the sweet and salty combination and think it is very fit for the holidays! In this particular cheeseboard, I added honey (that goes so well with the brie and the goat cheese), a variety of delicious olives that I picked up at the olive bar at my grocery store, fig jam (make your own or buy at the store), fresh grapes, crackers and parmesan bread sticks! I also added some fresh thyme for color and to make my board extra pretty. Other good options for fruits are: figs (LOVE fresh figs with cheese! ), pears, clementines, oranges, cherries, berries and apples. Some dried fruits also work really well, like apricots, dried cranberries and dates. Any type of fruit jam will work great with these cheeses! You can either go with the honey or the jam, but I like to add both because… well… go big or go home, right? As for nuts, candied nuts are my obsession. Salty Marcona almonds also pair amazingly with cheese! You can also add preserved meats, like salami or prosciutto, pickles and cornichons, sun dried tomatoes, and any type of bread or crackers that fits your taste. There is no rule here, just pick your favorite flavors and be creative! Wooden boards, marble (like I used here), ceramic, glass, cake stands and even cutting boards. Whatever looks nice, really! To assemble my cheeseboard, I first add the cheeses and then I start decorating the board with the fruits, nuts, olives and whatever other pairings I’m using. Don’t forget: a cheeseboard is all about the presentation! 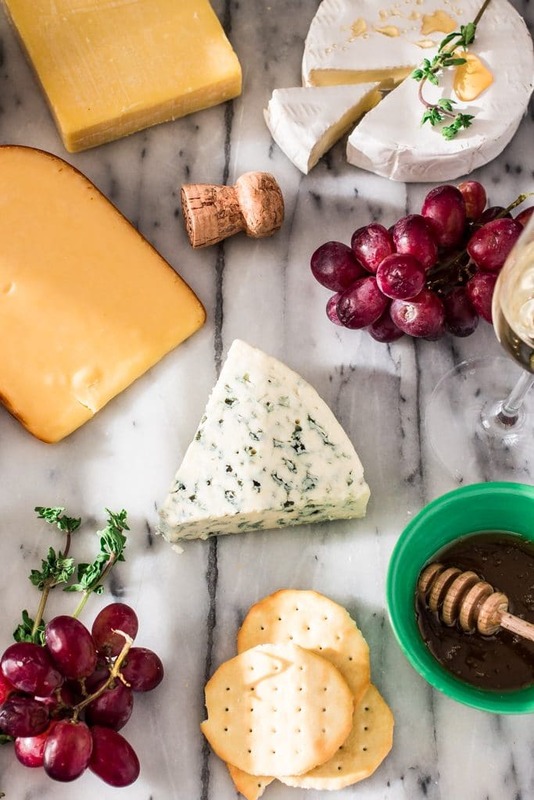 Let’s be honest: a good cheeseboard is not complete without a glass of wine. ? Since it’s the holiday season, and we all should be celebrating life, my choice here is a glorious sparkling wine from Gloria Ferrer. Exuberant and fruit-forward, Gloria Ferrer wines have earned over 400 gold medals and 50 90+ scores in the last 5 years. They have all the characteristics for versatility – generous fruit aromas and flavors, fine mousse, and a persistent, crisp finish. Gloria Ferrer prides themselves on sustainable and authentic practices that cherishes tradition and expertise. They are one of the few wineries that still use a more hands-on harvesting method. During the harvest season, their skilled staff goes out into the vineyards and hand-harvests starting at 2 in the morning to bring in the fruit when it’s cool, which means the grapes are at the optimal temperature when they are brought in to the winery. This care and attention to detail really reflects in their wines. Phew! That was a long post. I could definitely keep going as there are no limits for my love of cheese. How beautiful table of cheese, Olivia! And these Gloria Ferrer’s wines look also great, specially the Brut Rosé, your aunt Renata’s favorite wine!